I’ve got some exciting news to share today! My Deep Learning for Computer Vision with Python Kickstarter campaign is set to launch in exactly one week on Wednesday, January 18th at 10AM EST. 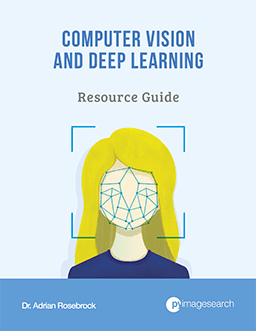 This book has only goal — to help developers, researchers, and students just like yourself become experts in deep learning for image recognition and classification. Whether this is the first time you’ve worked with machine learning and neural, networks or you’re already a seasoned deep learning practitioner, Deep Learning for Computer Vision with Python is engineered from the ground up to help you reach expert status. 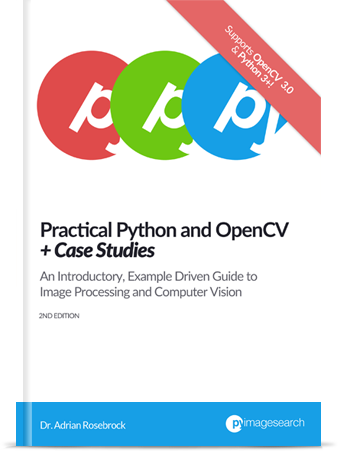 The Table of Contents for Deep Learning for Computer Vision with Python. This book is extensive, covering the basics of deep learning all the way up to training large-scale networks on the massive ImageNet dataset. You won’t want to miss this list! The full list of Kickstarter rewards (including early bird discounts) so you can plan ahead for which reward you want when the Kickstarter launches. I won’t be posting this list publicly — this reward list is only for PyImageSearch readers who are part of the PyImageSearch Newsletter. Please keep in mind that this book is already getting a lot of attention, so there will be multiple people in line for each reward level when the Kickstarter campaign launches on Wednesday the 18th. To help ensure you get the reward you want, I’ll be sharing tips and tricks you can use to ensure you’re first in line. Again, I won’t be posting this publicly either. Make sure you signup for the PyImageSearch Newsletter to receive these tips and tricks to ensure you’re at the front of the line. 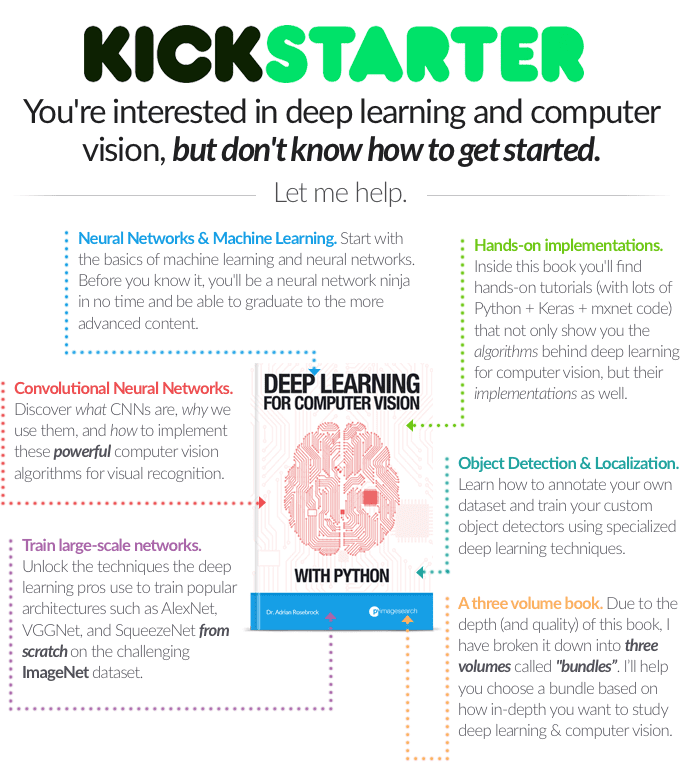 The Kickstarter campaign link that you can use to claim your copy of Deep Learning for Computer Vision with Python. To be notified when these announcements go live, be sure to signup for the Kickstarter notification list! 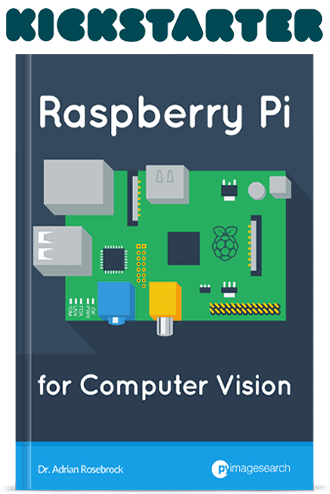 I just wondering this book will be with image processing or computer vision? 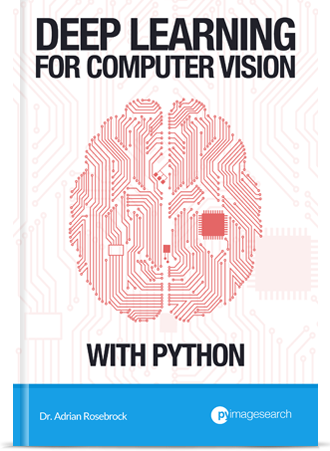 The primary focus of the book will be on how to apply deep learning to computer vision tasks such as image classification, object detection, etc. Hey Ranjith — The Kickstarter campaign is set to launch on January 18th. From there you’ll be able to back/support the project. Let me know if you have any other questions! I eagerly look forward to the Kickstarter campaign and the opportunity to be a part. I’m looking forward to the 18th. and did some Advertising on Twitter and Instagram. Good Luck. Thank you for your help and support Franz, I really appreciate it. How can i avail this new book? Hey Siddharth — I’ll be posting the link to back the Kickstarter campaign on Wednesday, January 18th at 10AM EST. If you are also on the PyImageSearch email list you’ll receive an email notification when the Kickstarter goes live as well. Can’t wait. I’m all ready with my credit card to back you! Haha! If you are just getting started with deep learning and simply want to understand the basics of neural networks and deep learning, go with the Starter Bundle. If you want a more in-depth dive and study more advanced concepts, go with the Practitioner Bundle. If you want the complete package, go with the ImageNet Bundle. What are the tools and minimum computer spec requirements for implementing the techniques? It depends on which bundle you go with. All examples in the Starter Bundle are intended to work with your CPU (although a GPU can certainly speed up training). The majority of the examples in the Practitioner Bundle will work with a CPU as well, although you should ideally be using the GPU since training times will increase dramatically. For the ImageNet Bundle, a GPU is absolutely required, ideally one with 8-12GB of memory. 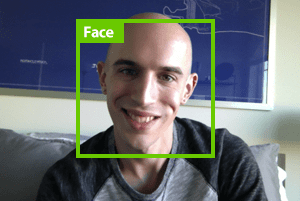 Multiple GPUs would also be preferred for the ImageNet Bundle. Waiting for Wednesday, January 18th at 10AM EST………….. It will be a pleasure to have you on the Kickstarter backer list, Leena! Let me know if you have any questions. Thanks Shankar, only a few more hours to go now!